Refer a friend and get $10 free credit when you go to PhonePower.com. Click link for details. Sign up for one residential phone line and receive the second one absolutely free at Phone Power. Click link for details. 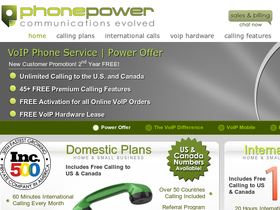 Head on over to PhonePower.com and pay only $8.33 per month for unlimited calling to the US and Canada.